A newly published study paints a grim outlook for the future of certain mammals and birds, suggesting that the average growing nation should expect at least 3.3 percent more threatened species in the next decade and an increase of 10.8 percent species threatened with extinction by 2050. Columbus, Ohio – The ongoing global growth in the human population will inevitably crowd out mammals and birds and has the potential to threaten hundreds of species with extinction within 40 years, new research shows. Scientists at The Ohio State University have determined that the average growing nation should expect at least 3.3 percent more threatened species in the next decade and an increase of 10.8 percent species threatened with extinction by 2050. The United States ranks sixth in the world in the number of new species expected to be threatened by 2050, the research showed. Though previous research has suggested a strong relationship between human population density and the number of threatened mammal and bird species at a given point in time, this study is the first to link an expanding human population to fresh threats of extinction for these other species. The lead researcher created a model based on 2000 data to forecast future threatened species connected to human population growth projections, and published the predictions in 2004. In this new study, that model’s predictions were confirmed by 2010 actual figures. The scientists then used the same model, containing data on 114 countries, to extend their predictions to the middle of this century. “The data speak loud and clear that not only human population density, but the growth of the human population, is still having an effect on extinction threats to other species,” said Jeffrey McKee, professor of anthropology at Ohio State and lead author of the study. The findings suggest that any truly meaningful biodiversity conservation efforts must take the expanding human population footprint into consideration – a subject that many consider taboo. McKee conducted the research with Ohio State undergraduate Julia Guseman and former graduate student Erica Chambers. The study is published this week in the journal Human Ecology. McKee collected data on threatened species from the International Union for Conservation of Nature Red List, and obtained human census data for 2000 and 2010 from the world database of the U.S. Census Bureau. Overall species richness data came from the United Nations Environment Programme-World Conservation Monitoring Centre’s Animals of the World Database. He created a model using equations to analyze relationships among these variables. After using 2010 data to confirm that the decade-old predictions came true, the researchers used the same equations to determine that between now and 2050, the nations that see the most population density growth will experience higher numbers of species facing new threats of extinction. Only five nations rank higher than the United States in predicted new species threats by 2050. The Democratic Republic of the Congo tops the list, with a predicted new threat to more than 20 species in that time frame. 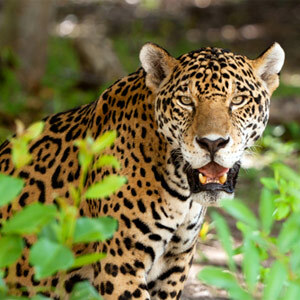 The analysis suggests about 11 species will be newly threatened with extinction in the United States. The model also suggests that the 21 countries with projected declining human populations by 2050 will see an average reduction in threatened species of 2.5 percent. The findings were bolstered by the fact that nine of the 12 nations with population declines between 2000 and 2010 showed a modest decrease in the number of threatened species of mammals and birds. “We might be able to utilize that knowledge and use those countries to repopulate species that are native to those countries,” said McKee, also the author of the book Sparing Nature: The Conflict between Human Population Growth and Earth’s Biodiversity. There are an estimated 12 million species of plants and animals on earth, and the human population exceeds 7 billion – with a gain of an estimated 214,000 people each day. When the population stood at 6 billion, McKee led a project with his students in which the group divided the planet’s land surface area among all the world’s people to determine how much space was available to each person. At that time, each of the world’s humans could claim space roughly equivalent to Ohio Stadium, which seats more than 102,000 football fans. “If we get to 11 billion people, which is where we’re supposed to peak, then the amount of space you have per person is a lot smaller than that stadium. When you’re left with less space, there’s virtually no space left for most other species,” he said. Loss of species, and especially so-called keystone species that are important to the environment because they function as significant predators and prey, can disrupt ecosystems. Plants and animals also help the planet adjust to climate change, provide oxygen and are sources of food and medicines, McKee noted. 3 Comments on "New Study Links Expanding Human Population to Threats of Animal Extinction"
Problem, reducing birthrate decreases human diversity. Human overcrowding will lead to more conflict over diminishing resources and will add to our current psychic stress. Not encouraging … do we need another extinction (primarily of humans and hopefully minor)? In 2012, a modelling study was published (see reference below) with conclusions similar to those of McKee et al. : It also indicated that future biodiversity losses across the world will depend very much on future human birth rates. Dumont, E.: Estimated impact of global population growth on future wilderness extent, Earth Syst. Dynam. Discuss., 3, 433-452, doi:10.5194/esdd-3-433-2012, 2012. I agree with McKee that there is a taboo on the link between extinctions/biodiversity and global population growth/birth rate/family size. I think this is very unfortunate, because without this taboo it would be much more likely that people would also consider the environment when deciding about having children.